All our practices offer free weight and nutrition advice and clinic appointments are always available. 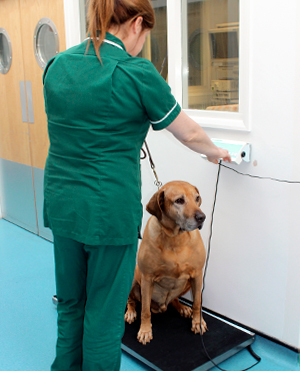 Our veterinary nurses will advise you on the optimum weight for your pet and will also give advice on food, nutrition and other dietary requirements. If your pet is overweight, it increases the risk of developing arthritis, diabetes, heart disease and breathing problems. Our nurses can offer invaluable advice and help to prevent these conditions. We also sell a wide range of foods suitable for weight control in pets, please ask one of our experienced team to advise you on the best food for your pet.